We carry out most of our research work at the ONDL. The ONDL operates a set of five laboratories, a preparation room and a facilities farm. These have been set up over four phases beginning in 2005. The final phase was completed in 2010. ONDL 1-4 are a set of Class 1000 and Class 10,000 cleanrooms (total area 240 sq m) with local Class 100 clean space, while ONDL 5 is a wet chemistry laboratory. ONDL 1: Class 1000 Fabrication Facility with full capabilities in optical lithography, plasma processing (silicon oxide and ammonia-free silicon nitride CVD; O2- and CF4-based RIE; and general O2 barrel plasma), glovebox fabrication with integrated spinner and a customised electron-beam and thermal evaporation chamber, wire-bonder, and Class 100 laminar flow hoods. ONDL 2 and 3: Class 10,000 Characterisation Facility for the optical and electrical characterisation of polymer organic semiconductor films and devices, with variable temperature capabilities in the characterisation of light-emitting diodes, transistors, photovoltaics and solar cells, and luminescent films. We also operate a multi-excitation-line Raman microscope, facilities to perform both wavelength and radiometric calibrations of our photodiodes and spectrometers traceable to NIST standards, UV-Vis-NIR-FTIR spectrometers and a spectroscopic ellipsometer. We also operate home-built electromodulated absorption spectroscopy, internal photoemission and charge-modulation spectroscopy rigs. ONDL 4: Class 1000 Film Processing Facility comprising materials inkjet printers. We also operate a cryogenic probe station that goes down to 4 K.
ONDL 5: Chemistry wet lab with fumehoods complete with chemical synthesis facilities. We make and prototype the following devices in our research: polymer organic light-emitting diodes (OLEDs), organic field-effect transistors (OFETs), organic photovoltaics (OPVs) and solar cells. 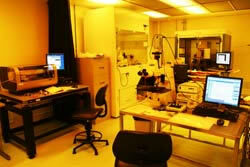 You may already have noticed that our cleanroom has a more orangey tone than the normal "yellow" cleanroom. This is because we have specially designed our cleanroom lightings to cut off wavelengths above 550 nm to avoid any possibility of photo-oxidation of organic semiconductors and materials. For other non-device characterisation, we are supported by Department and Faculty research facilities including AFM, SEM, TEM, UPS, XPS, XRD, NEXAFS, elemental microanalysis, NMR, DSC, TGA, etc, some of which we operate ourselves. This unique combination of physics and chemistry tools based on dedicated device cleanroom facilities supported by a wide range of general characterisation facilities provides us the competitive edge to our research.